Alright, it’s been a long time (long time) since I left you (left you) without some dope gear for re-view (RIP Aaliyah). I’ve been away from the site for a couple of weeks because I got married (!) to an incredible woman at the end of May, then immediately scooted out of the country for a lengthy honeymoon. Everything was awesome, the food was incredible, and I bought a cymbal in Istanbul. Fantastic. But, now I’m back, and it’s high time I nerd-ed out over some sweet gear. Before we jump into the return of Stick of the Week, however, let me remind you guys to go enter our incredible Outlaw Drums snare giveaway. It runs through June 19th, so you’ve still got a few days to enter. Don’t miss this one. Price: All models: $7.00 from Lone Star Percussion. Not long after the 2012 PASIC convention, a really awesome dude named Robert from Pro-Mark’s marketing team shipped me a package that included, among a few other items to be reviewed later, the company’s maple Jazz Café series. Robert told me that he sent them specifically because I would probably like them based on a few conversations we’d had. Smart guy. Basically, I’m a big, ham-fisted mutant who likes to think he can play a little jazz music every now and again. I can’t, but that’s really beside the point. For years, I’ve wrestled with volume control in soft situations – particularly those that require me to stretch out a little bit. Most conventional “jazz” sticks never sound right in my hands (they either sound too thin or create too many overtones when combined with my terrible technique). It’s definitely a problem with my playing, but even so, I’ve always been on the hunt for a stick to help me reel things in while still giving me the sound I’m looking for. Well, a couple of models in the Jazz Café series came about as close to that as I’ve found with any stick. Each of the five MJZ models features a maple body with a smaller build and a diminutive tip. In some ways – mostly size – they kind of recall the sticks used in the 50s and 60s, but with a sleeker, more modern design. All of the sticks are a little shorter than the current average, light-weight and very nimble. Let’s take a quick look at each model individually. Size-wise, the MJZ-3s land just about in the middle of the Jazz Café pack because of their length. With their rounded acorn tips and long taper, they look a lot like a standard 5A that’s been hit with a shrink ray (I hate rhyming accidentally). 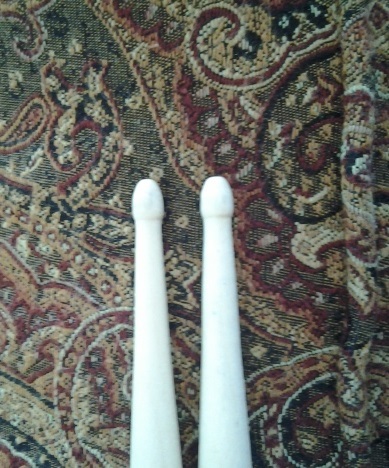 The wide, maple tips offer a really pleasant, dark attack on cymbals with a nice spread underneath. The stick also pulls a focused tone out of toms and snares, but has just enough meat to draw out some resonance and prevent the note from sounding papery like many other small sticks I’ve found. The 3s were also some of the most well-balanced of the bunch. Every stroke felt even and smooth with just enough weight on both ends to give me the kind of rebound I need. The MJZ-5s are, for the most part, a larger version of the MJZ-3s. The have a very similar balance and feel, but with a little more length and weight to bring out some extra volume and low-end from toms and snares. I will say that in my hands (remember: miserable technique), the 5s produced a few more unwanted overtones from my cymbals than I would have preferred. As the largest models in the series, they felt like they’d be perfect for bringing the overall volume down on a standard rock kit. With my gorilla bashing though, they were just a little too large for me to control on thin cymbals and small drums. The MJZ-7s are a really interesting stick. They’re short sticks with a medium diameter and a super thin and long taper – very, very mobile design. What I found most interesting though, was the tip. The MJZ-7s look like Pro-Mark took regular oval or acorn tips, and played them down for six months. Several of my friends who play jazz consistently do this to their regular sticks to get a smaller sound with more focused attack, so I found this tip design really intriguing. It took me a while to figure out how to play the 7s appropriately, but once got them under control, I really enjoyed the very thin (in a good way) sound they gave me. Everything was tight, clean and quick, making it easy to keep from stepping on other instruments. Very interesting stick. In low volume situations, I normally play a larger maple stick with a small bead. The MJZ-9s were the closest to that design of all the Jazz Café sticks, but they were still a good bit smaller than I was used to. They have a nice, even taper with a very small tip that made keeping a low volume very easy, but still gave me that super dark, pointed sound I prefer in softer settings. Of the group, I’d say these were my favorites, probably because they offered a quieter version of what I’m most comfortable with. Much the like MJZ-9s, the MJZ-11s feature a tiny ball tip, but with an even smaller body. The taper and balance are roughly the same, but the 11s start to get into pencil territory – super light and thin. These were just a hair too small for my hands, and I never really felt like I had them under control. Despite that, the sound they produced was wonderful. The ball tip gave me a beautifully focused attack on cymbals with the perfect amount of wash at all levels. I couldn’t believe that a stick this small didn’t sound waifish in any way. Instead, each note was pronounced and full, just on a smaller scale than what you might hear from a larger stick. I’m going to keep playing with these as much as possible to try and get the diminutive size under control. That sound is just too nice to give up on. I know that most pros and educators will tell you that you should be able to get the sound you’re looking for with a stick of any size. With plenty of practice, I’m sure that’s true, but I’ve just never been able to get there as easily as some of my peers. So, when the good people at Pro-Mark sent over these excellent, light-weight maple sticks, I was thrilled to find something that actually helped me achieve the sound I wanted within a more manageable volume spectrum. I’ll keep practicing and working toward being able to get that sound with a chunky 2B, but in the meantime, the Jazz Café series will certainly help me handle some of those softer gigs. Well written review. I believe, like drums themselves, different tools (i.e., stick woods and sizes) allow you to diversify the sounds you can extract from your instrument. Nothing wrong with options… and the difference can be substantial when recording! I’ve recently become a big fan of maple sticks. 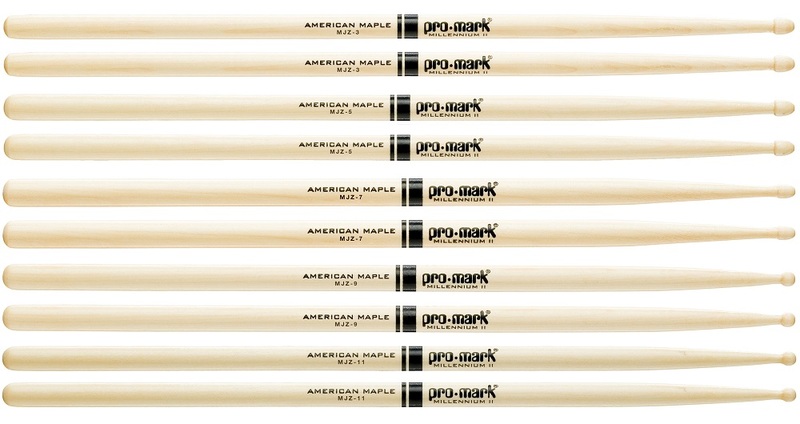 Excited to try some of these out… I’m tired of my Pro-Mark 7A hickory! Awesome review. What are your thoughts on the Shira Kashi jazz drumsticks by Promark? I haven’t played them unfortunately. Sorry, wish I could be of more help!